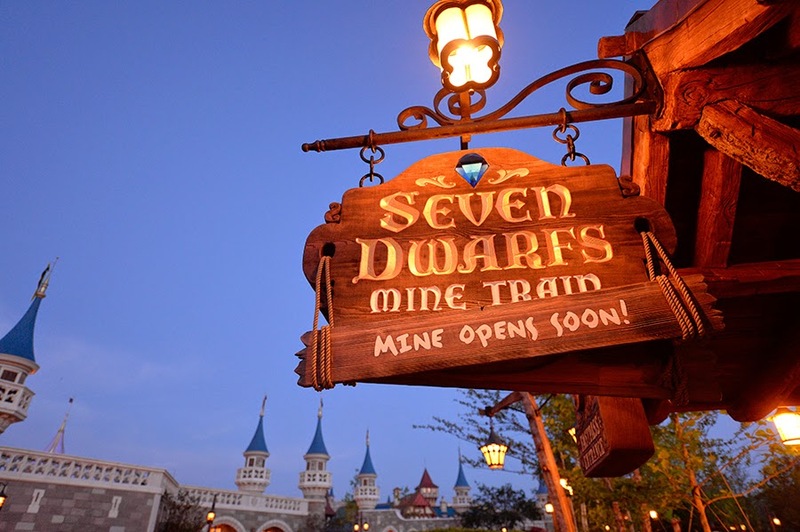 Tomorrow marks the start of three days of media hoopla for the Seven Dwarfs Mine Train (and other new attractions) at Walt Disney World. The Preview Event runs April 30th to May 2nd, with the official ride dedication coming on the last day. Here's the progress that's been made over this past week. DaMouse posts pics from the east side of the attraction showing that more construction walls have been removed. 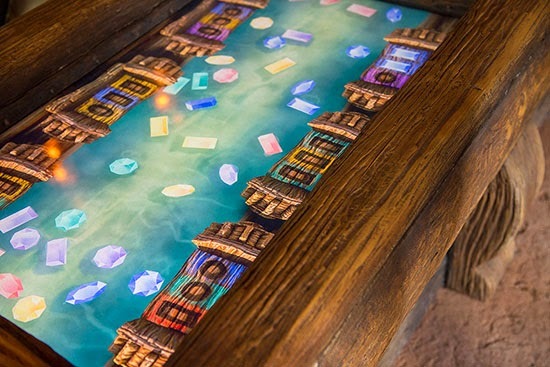 Disney Parks Blog releases more images from the interactive queue including this 15-foot digital sluice box. Guests can drag gems into different trays and match them by color and shape. 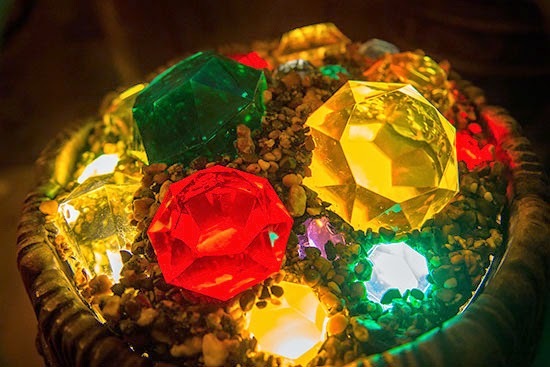 Buckets of gems with glittering lights. 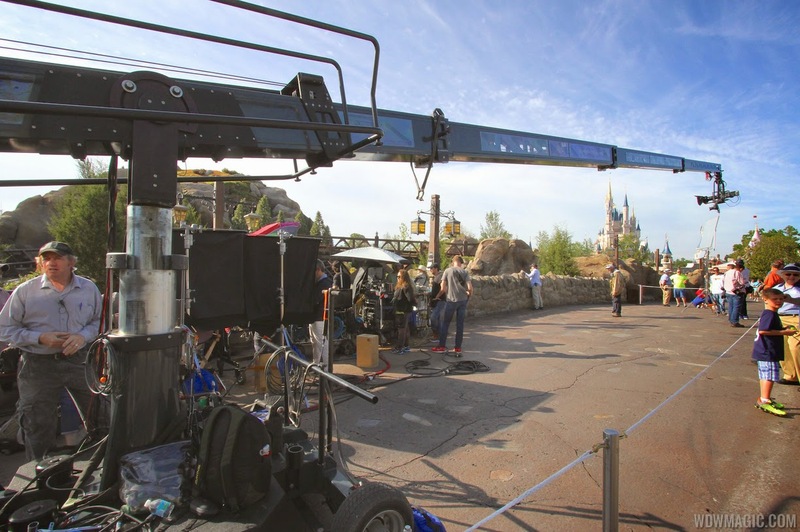 A film crew is spotted shooting a commercial for the attraction. Actors are seen riding the coaster. Video of the actor train posted by Attractions Magazine. 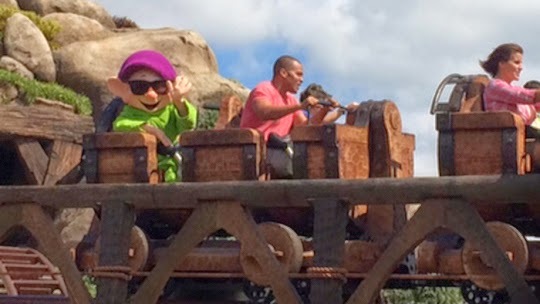 InsideTheMagic has video with Dopey bringing up the rear, sporting a pair of sunglasses. 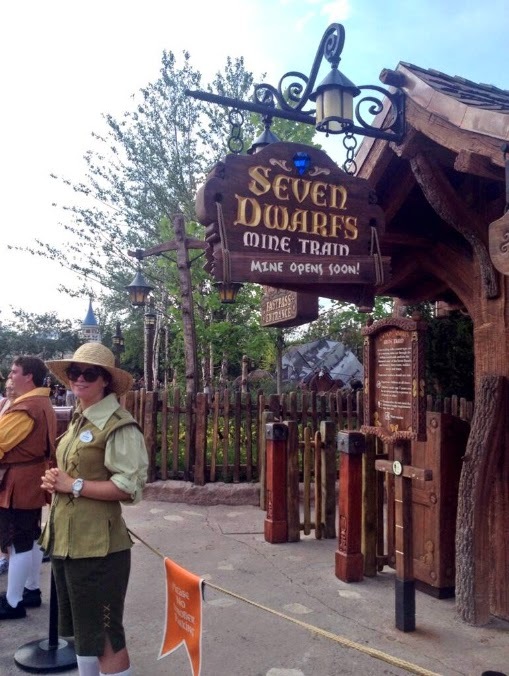 Dopey screen capture posted on WDWmagic forum. 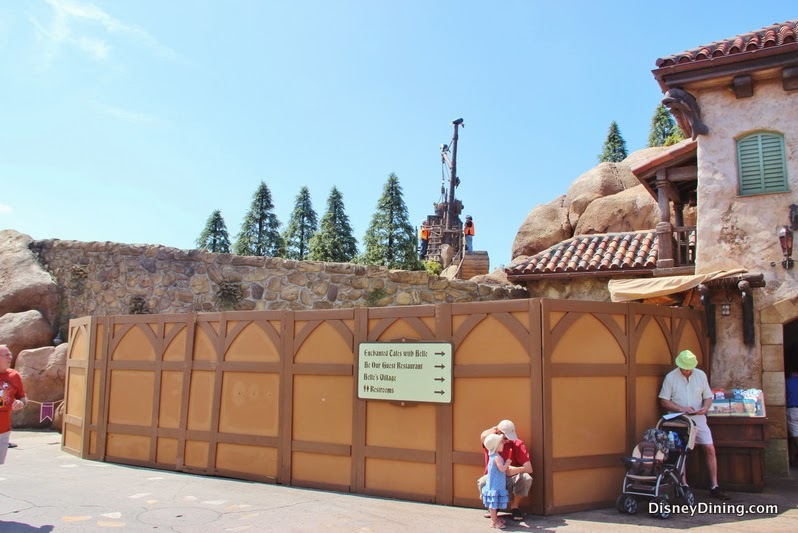 All of the construction walls have been removed (except for a small service entrance section at the rear of the mountain). 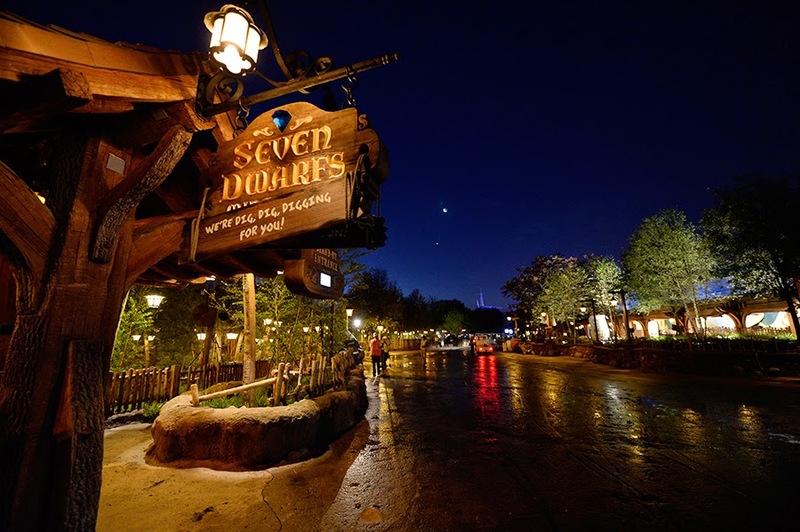 The Disney Parks Blog shares these shots of the main entrance at night, free of any barriers. 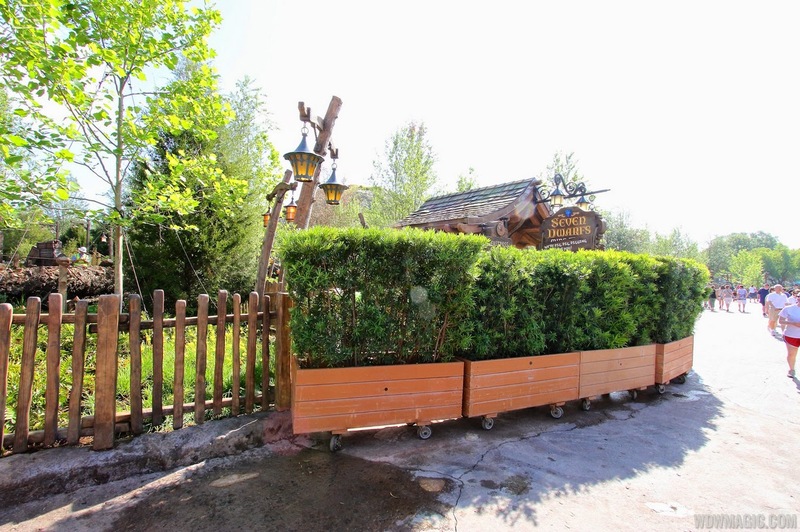 During park hours, the front entrance is now barred only by a line of rolling bushes--an indication that a soft opening may be imminent (i.e., they can quickly and easily be moved to allow park guests in or to keep 'em out). In addition to the interactive queue inside, the wait line will also wind around outside through the forest-like setting. 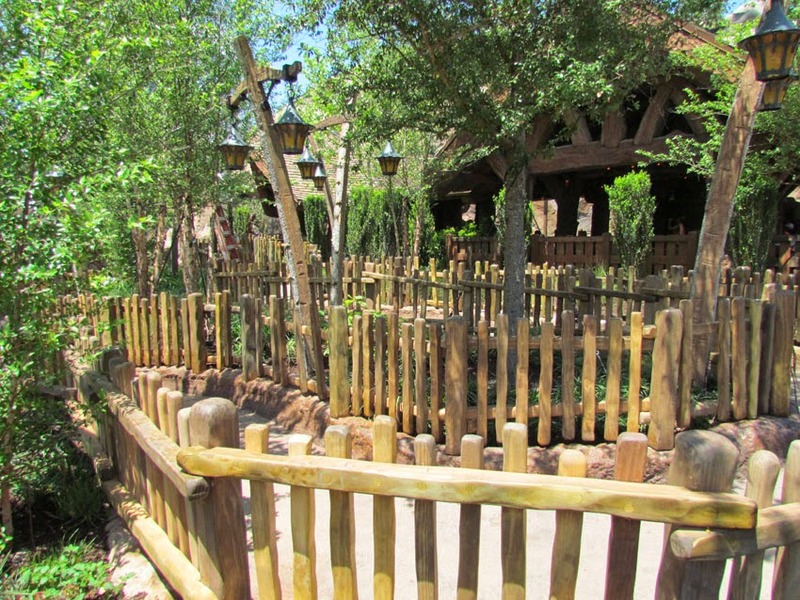 A large stroller parking area to the right side (across from The Many Adventures of Winnie the Pooh) awaits parents with young ones. 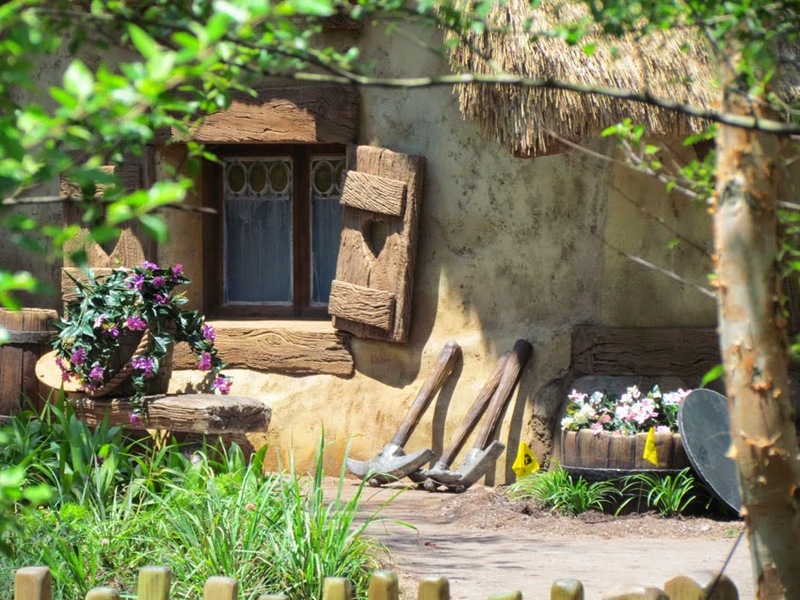 John Frost of The Disney Blog posts more pics of the queue area and one from outside the Dwarfs' cottage. 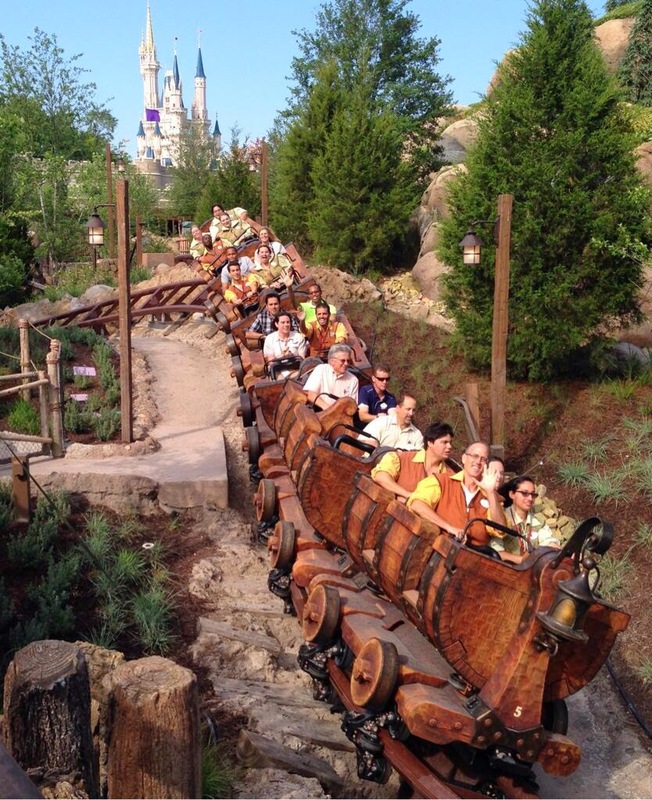 A photo uploaded to the WDWmagic forum creates a stir with a few folks. 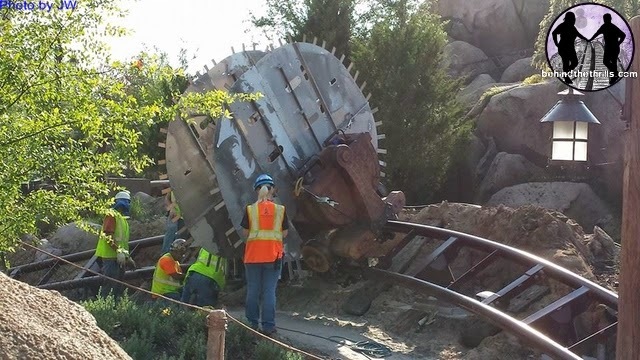 The shot shows a mine car going along the track with two metal attachments on board, looking like a couple of giant saw blades. The conclusion by some is that something must be wrong with the track, and the opening will now surely be delayed. Over at Behind the Thrills, they explain exactly what's going on. The workers are conducting "envelope" tests. 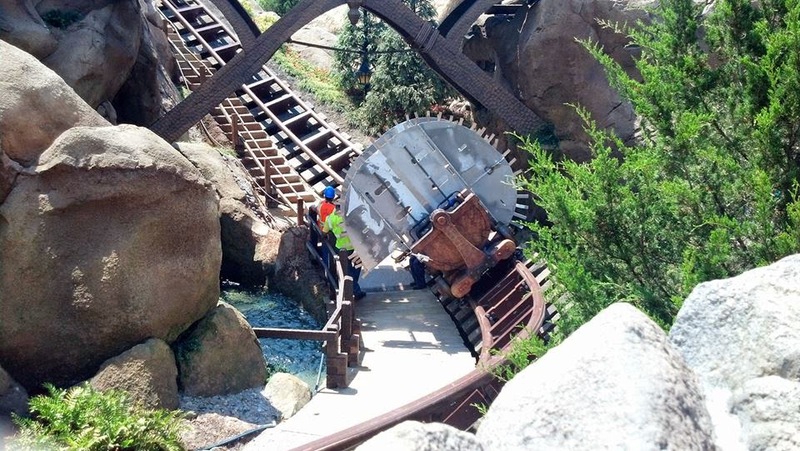 The coaster must move along every inch of the track with these metal pieces sticking out. If one or both should graze something--a branch, a wall, a bridge support--then it's at an unsafe distance from the riders. Even if guests are able to stretch their arms out as far as they will go, they shouldn't be able to touch anything. This is known as the coaster's "safety envelope"--the testing of which can be slow going. 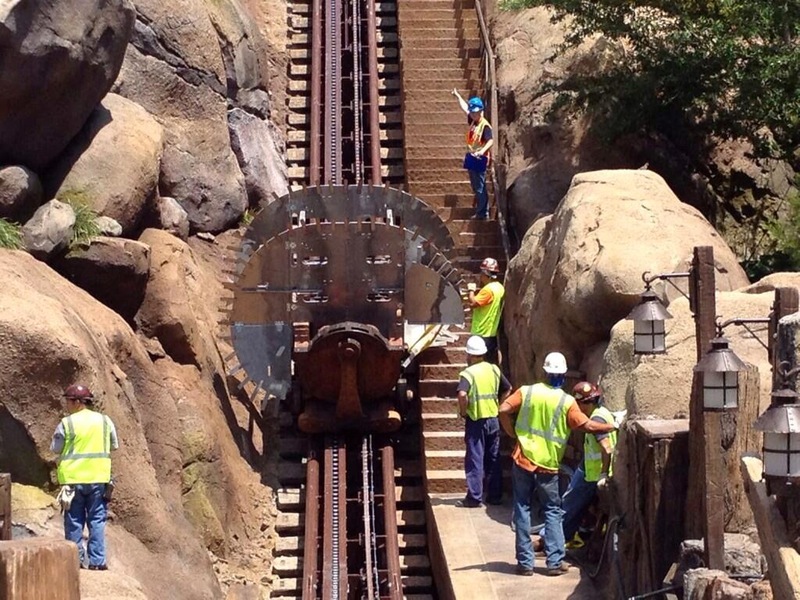 However, it's standard practice and yet another good sign that we're getting closer to the opening of the attraction. Photo and video posted by Behind the Thrills. Testing photo posted to The Disney Blog facebook page. 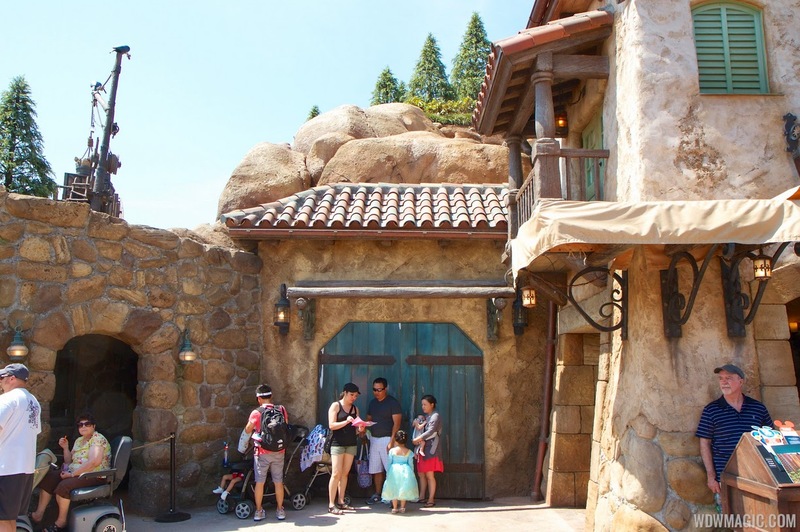 Gone from the front entrance are the rolling planters, replaced only by a rope and smiling cast members. Image posted on LaughingPlace twitter. The last of the constructions walls come down revealing the back service entrance. 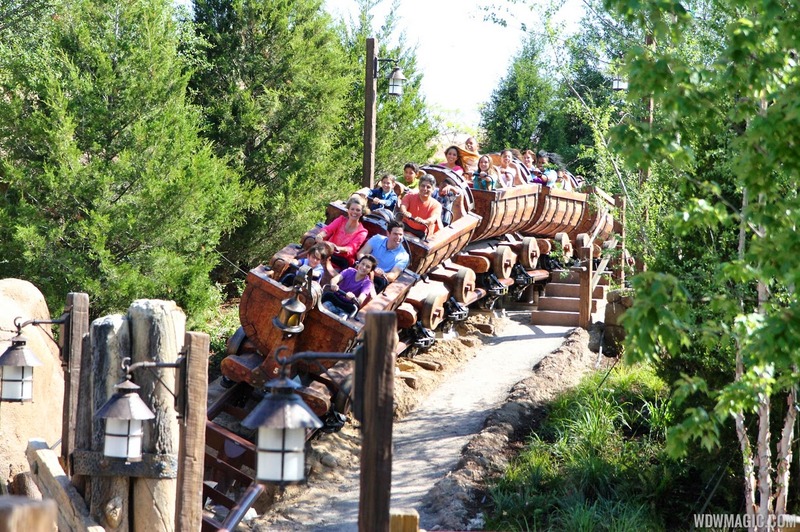 No soft openings yet for the general public, but cast members are spotted riding the coaster in the morning. Image posted on the WDWmagic forum. 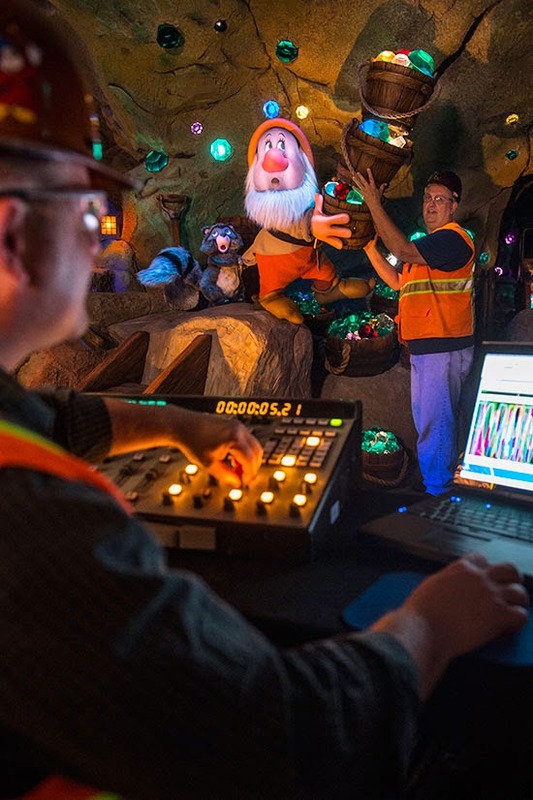 WDI releases more pics of the 3D audio-animatronic Dwarfs and a video on how they were created. 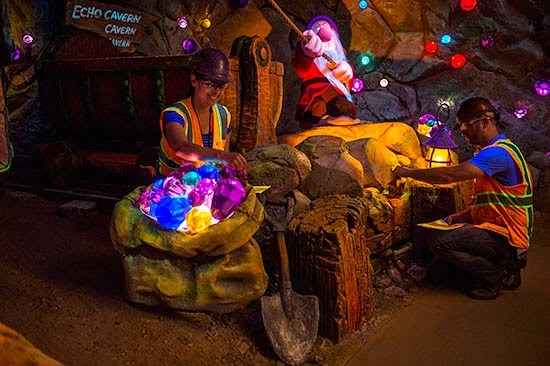 Posted on the April 29th Disney Parks Blog. While the wait is near over, it will be members of the invited press who ride the coaster next during the Preview Event this week. Still no official word on when it opens to the general public, though soft openings are surely coming soon. 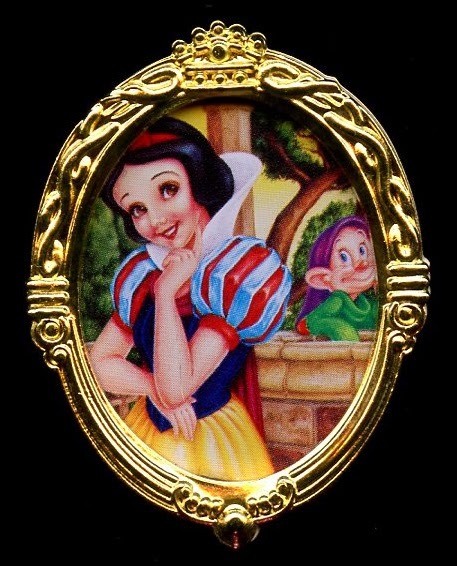 The same Snow White's Grotto artwork seen in the year 2000 Character-of-the-Month litho and pin was also used for a collectible coin. Matte brass finish. Measures approximately 1.5" across. Limited edition of 4500. 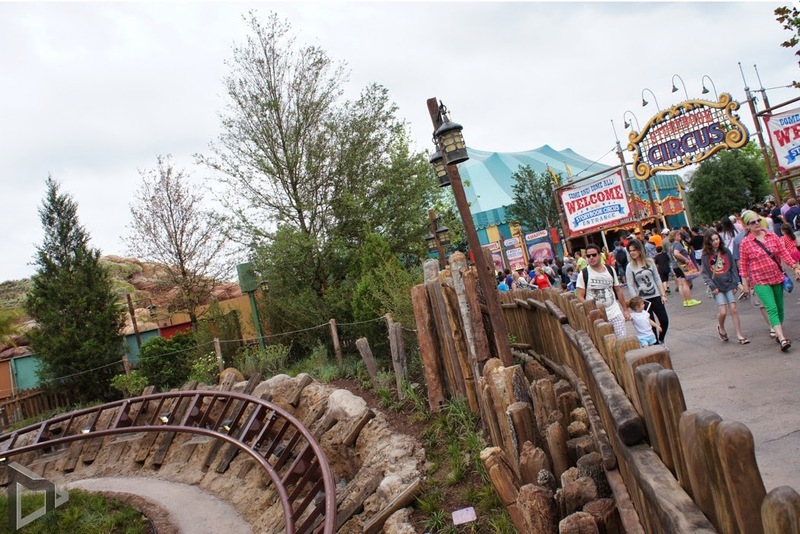 The opposite side is marked Disneyland Park - 45 Years of Magic and © Disney. 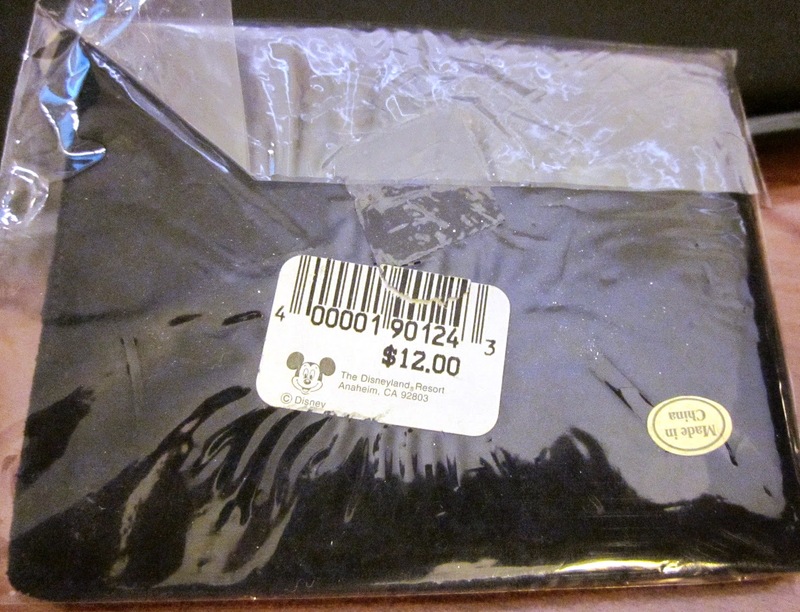 Original retail price $12.00. Made in China. 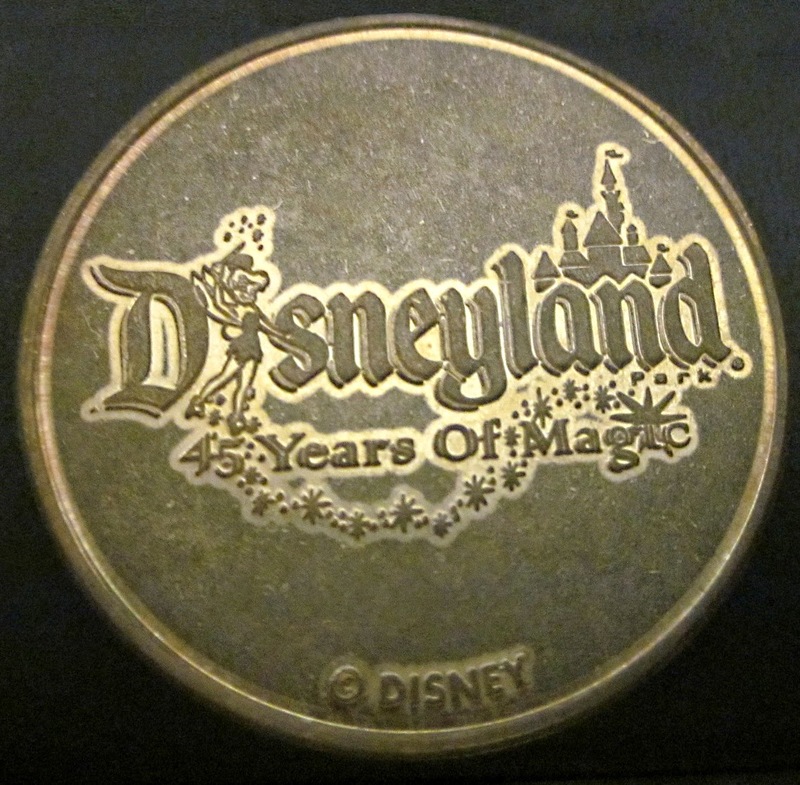 The coin was issued in a blue velvet envelope (4" x 3") with the "Disneyland" graphic embossed in silver across the flap. ...which contains the certificate of authenticity. Images courtesy of 1937Fan at Whistle While We Blog. 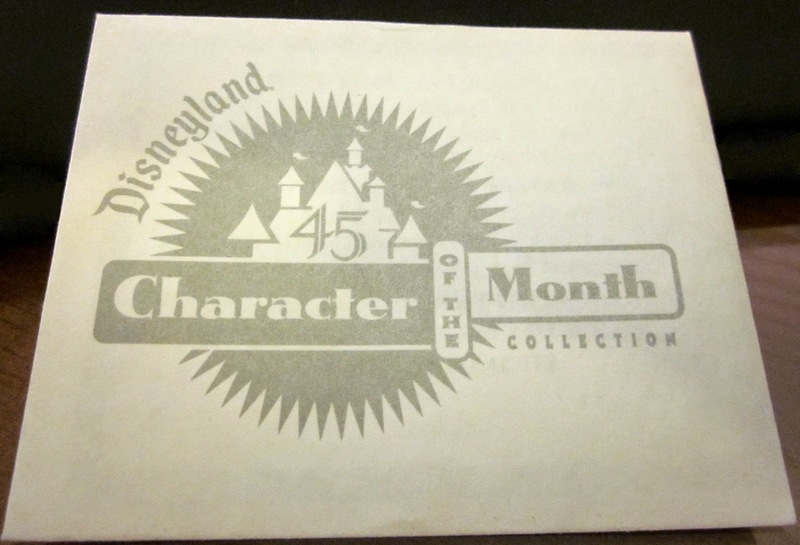 The Character-of-the-Month series was initiated at Disneyland just as the Disney pin craze was picking up steam. It consisted of 12 limited edition oval pins, one for each month of the year. The first few retailed for $10.00 a piece. The later releases went for $12.50. Only 500 of each were created. 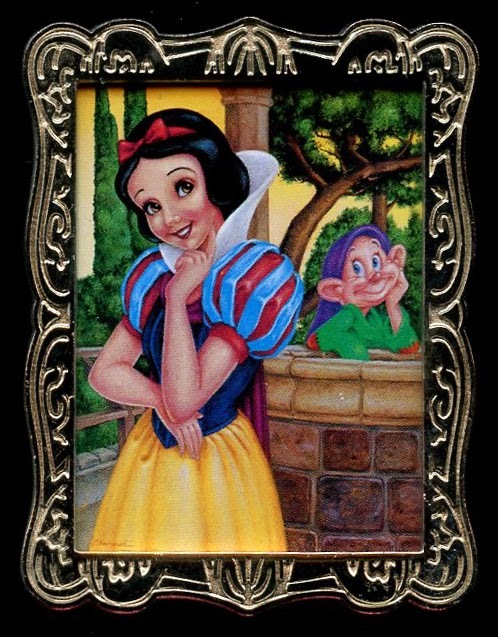 The Snow White pin came available on May 2, 2000. 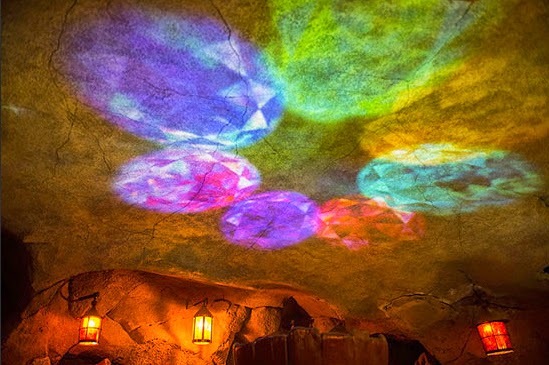 The artwork, by Disneyland character artist Peter Emmerlich, places the princess in front of the Wishing Well at Snow White's Grotto. Dopey looks on in the background. Gold frame. It sold for $12.00. This was before all the pin manufacturing was contracted with China. 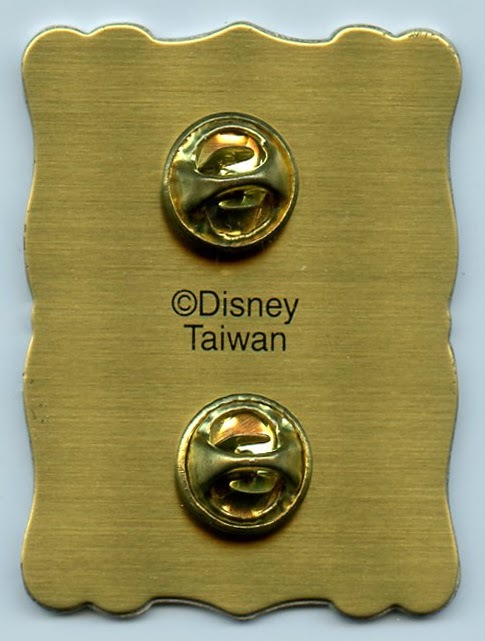 The back is marked "© DISNEY TAIWAN". 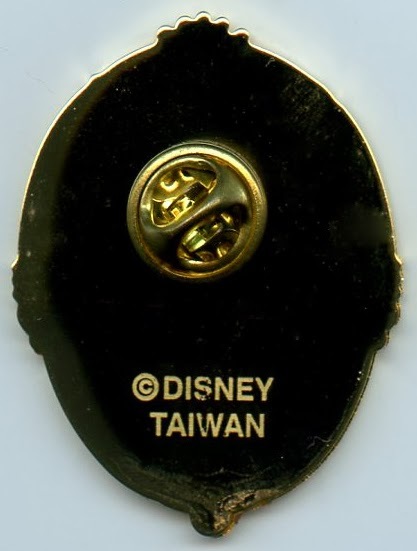 The pin clasp is the older metal style rather than the rubber mouse ears seen today. For those not fortunate enough to land the limited oval pin, a rectangular open edition version was also released that May. Silver frame. Retail $8.00. 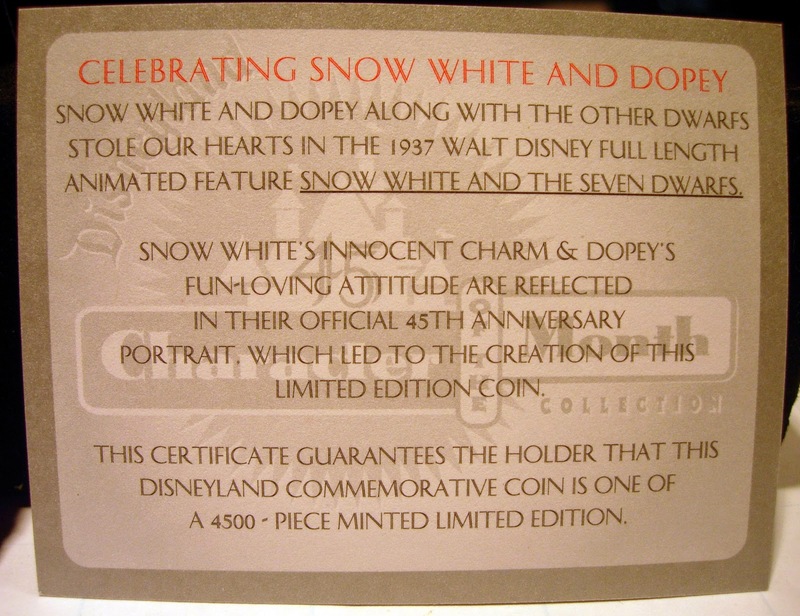 There was also a Snow White Character-of-the Month lithograph and coin. 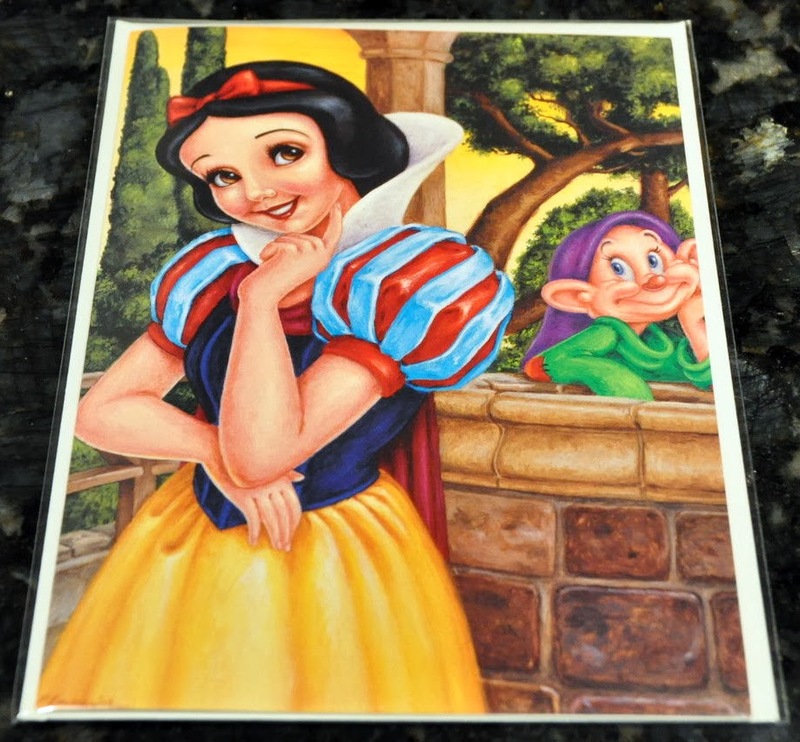 Issued during Disneyland's 45th Anniversary celebration, this Snow White lithograph was part of the year 2000 Character-of-the-Month series. For just 2 hours (1:30-3:30 pm) on May 13, 2000, Disney artist Peter Emmerich was on hand at the Disneyana Shop, Main Street USA, to sign a limited edition of 200 lithos. 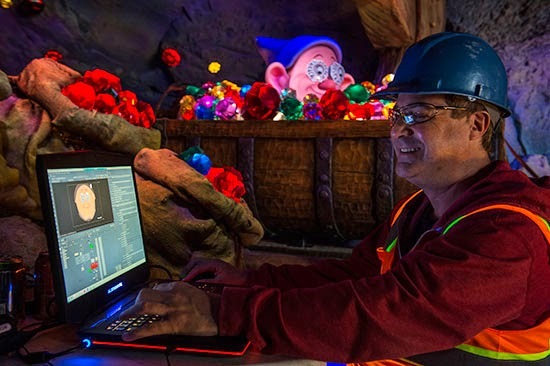 Snow and Dopey are shown standing at the Wishing Well in Snow White's Grotto. Notice that her dress is that of a cast member design rather than what was seen in the original motion picture. Print measures approximately 16" X 20". 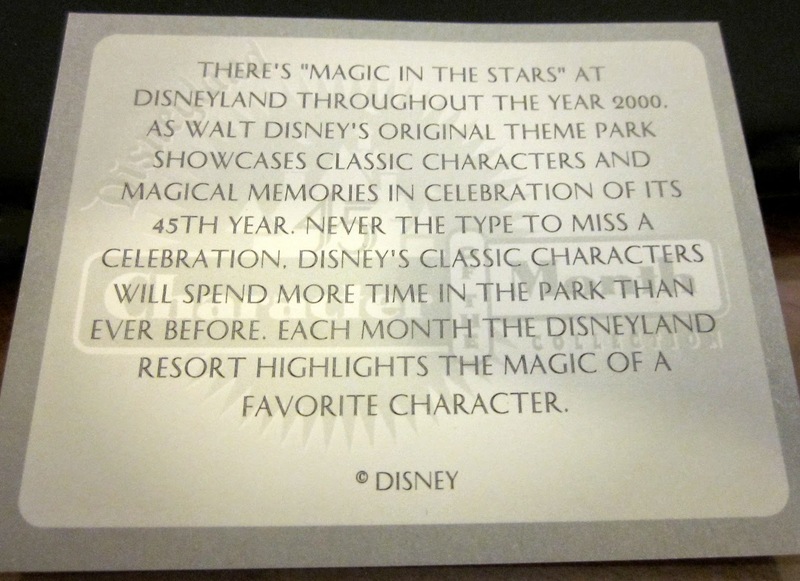 Signed by the artist and embossed with the Disneyland Character-of-the-Month seal. Greeting cards (5" x 7") were also available (as were pins and coins). 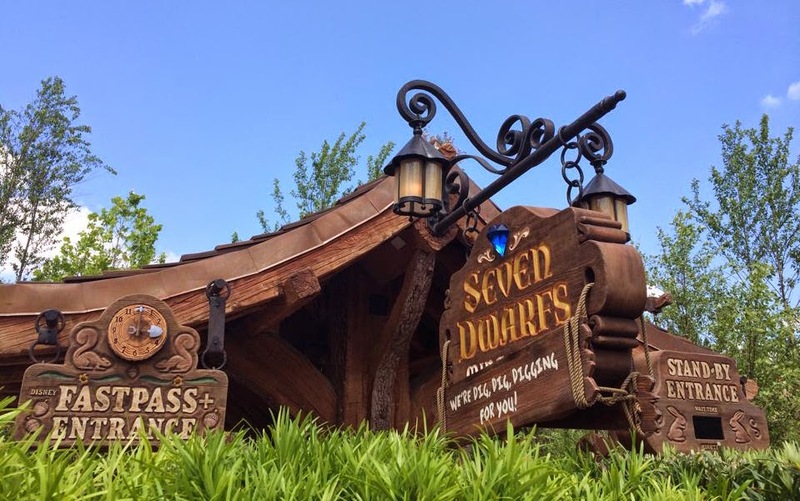 During the 1987 Golden Anniversary of Snow White and the Seven Dwarfs, One Stop Posters issued a door-sized Snow White poster with "woodgrain" artwork. They also distributed this set of buttons. No anniversary markings are visible, but they were created during this commemorative period. 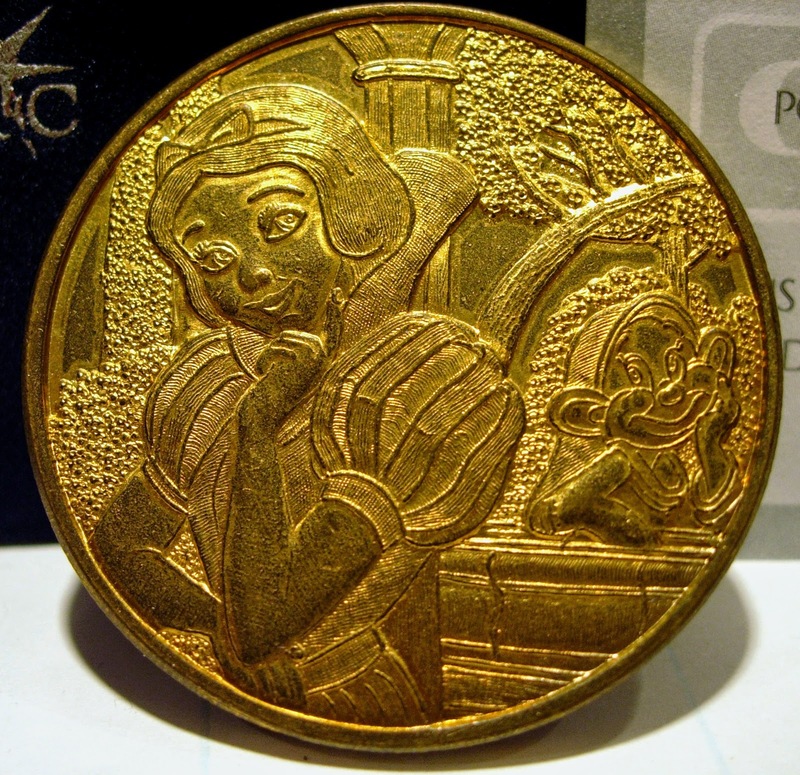 Another series of Snow White buttons were also released in the mid 1980s. Each measures 6" across. In addition to having the normal pin-back, they also feature a die-cut easel-back for free-standing display. The metal rim would also allow for wall hanging. The button card on the left is copyrighted 1985. On the right, 1987. Additional button image via daceman68, lostintimeantiquesvintage, poolmaster5. Also see the One Stop 50th Anniversary logo button in an earlier post.